XIAN, April 24: President Bidya Devi Bhandari, who is on the State Visit to China at the invitation of her Chinese counterpart Xi Jinping, has arrived in Xi'an today. 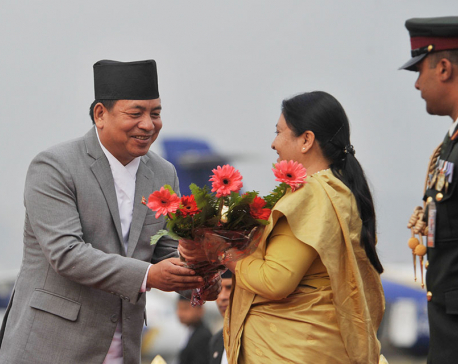 KATHMANDU, April 24: President Bidya Devi Bhandari left for a nine-day state visit to the People's Republic of China today at the invitation of her Chinese counterpart, Xi Jinping. SURKHET, April 24: Chief Minister of Karnali State government Mahendra Bahadur Shahi has said that the country would not achieve prosperity without the promotion of the national capital. 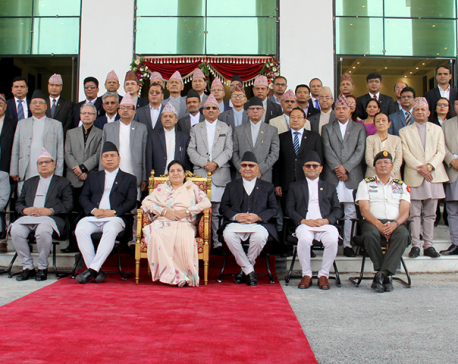 KATHMANDU, April 24: President Bidya Devi Bhandari has left for a state visit to China, on Wednesday. KATHMANDU, April 24: The government has initiated the process of amending the law to give recognition to electronic records and digital signature as evidence in law. 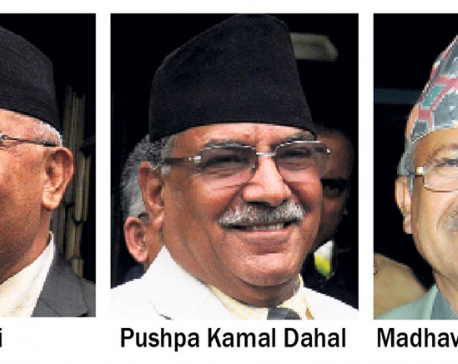 KATHMANDU, April 24: Top leaders of the Nepal Communist Party (NCP)—KP Sharma Oli, Pushpa Kamal Dahal and Madhav Kumar Nepal-- are in a position of near equilibrium in the post-merger power equation in the party. KATHMANDU, April 24: The media fraternity in the country has grown wary of repeated 'obstructions' against the private sector press covering public events involving President Bidya Devi Bhandari. KATHMANDU, April 23: The ruling Nepal Communist Party (NCP) chairman and former Prime Minister Pushpa Kamal Dahal has said that the aspirations of the indigenous people have been addressed in the Constitution. 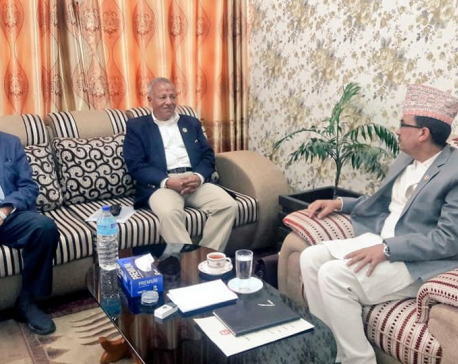 KATHMANDU, April 23: Talks were held between the government and the Rastriya Prajatantra Party today in response to the latter's 32-point demand including restoration of a Hindu State. KATHMANDU, April 23: The government is holding talks with the agitating Kamal Thapa-led Rashtriya Prajatantra Party (RPP) today.